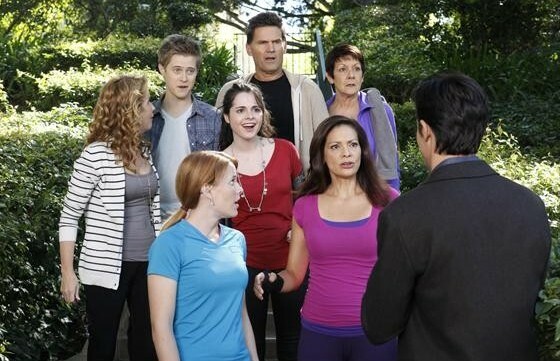 Last season, ABC Family renewed Switched at Birth even though the ratings had fallen. Will they keep falling? Will this drama be cancelled or renewed for a fourth year? Stay tuned to find out. Switched at Birth follows the lives of two teenage girls who discover that they ended up with each others’ families at the hospital where they were born. The cast includes Vanessa Marano, Katie Leclerc, Lea Thompson, Constance Marie, Sean Berdy, D.W. Moffett, Lucas Grabeel, and Giles Marini. 8/13 update: ABC Family has renewed Switched at Birth for a fourth season. Final season averages: 0.6 rating in the 18-49 demographic with 1.42 million total viewers. For comparisons: Season two of Switched at Birth averaged a 0.7 rating in the 18-49 demographic with 1.72 million total viewers. What do you think? Do you like Switched at Birth TV series? Do you think that it should be cancelled or renewed for a fourth season? Love this show. I never get home in time and watch it later on on a different website. Maybe that has to do with the ratings lowered? If cancelled ATLEAST give an ending with the next episode. Waist of four years if not. LOVE THE SHOW ^.^ if there is one show that should not be cancelled. it’s this one.